We’ve got a new farm dog! Since our old labradors, three legged Pup (16 years old) and Wab (17 years old) died, we haven’t had a good old farm dog. We have our three wolf-husky hybrids in the dog yard, but I’ve always had a dog in the house that went everywhere with me; chores, in the truck, fishing, hunting, you name it, the dog was there. Mom has a small labrador/beagle mix that came with Mom and Dad when they moved here with us. But Ike is a town dog; he doesn’t do chores, follow me around; he just wants to sit in the house. For a year or more, I’ve wished we could get another labrador retriever to take the old friends’ place. But I’ve never found a free pup looking for a good home, nor have I been able to afford a registered pup, to the tune of over $250. But just last week, the folks at the local feed mill ran an ad for the last of their 11 lab puppies; $100 or best offer. David was excited. He said he’s put up $50 if I would. So I told him to see what was left. Now he’d never been trained to attack and he sure wasn’t mean. I thought maybe he’d jump at the window and bark. Ha! He jumped over my shoulder RIGHT THROUGH the window and was at the car in a heartbeat. You could just see white teeth flashing in the moonlight and four men pile back into a car, screaming like girls. We have predators around, not having given us any trouble, but a gun and a good dog go a long way towards keeping it that way. And you need a dog that can handle a large predator without damage. But you DON’T want a dog that will eat your chickens. A well trained lab won’t do that either. Our wolf-huskies are great sled dogs, but no amount of training could teach them that those feathered temptations were NOT their play-toys or dinner! 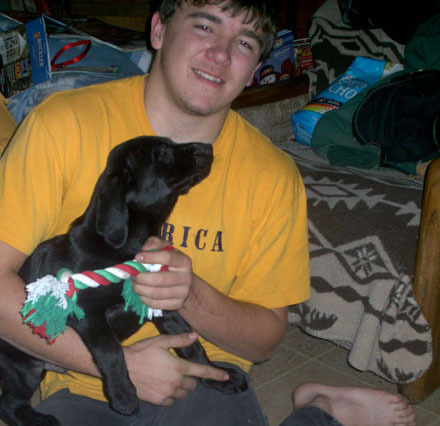 So David came home, bearing a little 9 week old black lab. “His name is Spencer,” David informed me. “He just looks like a Spencer,” he said. Well Spencer stopped at the vets on the way home for his shots and worming and now we’re in the process of housebreaking and training him. He’s smart, too. He’s already learned to sit and come. A great benefit is that he’s entertaining Mom. She gets bored in the winter, and Spencer is giving her plenty of attention and entertainment. Winter won’t seem so long this year. This is a hard question to ask because I don’t now how to ask it. But were goes have you had any body ask you how to do things one handed. like dressing chickens or gardening and so on? I only ask because I have only one hand. I now you had cancer in you arm so how did you do that stuff and other with the use of only one arm? This is a problem I’ve had lots of experience with. Yes, I had cancer surgery on my left elbow and was a bit laid up with that, but also my adopted son, Javid, from India came to me with multiple handicaps. These left him paralyzed from the waist down and also in his left arm. As he wanted to join in all the homestead activities with the rest of the family, he grew adept at using his chin or a heavy duty fish scaling board with a clamp on the end to hold various items. We still joke when we talk about him helping husk corn because he held it under his chin and pulled the husks with his able hand. We call it “chin corn” and he says there was never any corn that tasted quite as good after he grew up and left home! You can clamp a chicken with the fish scaling board (even if you have to jerry-rig it a bit). You didn’t say if you have an arm that works. If so, you have a great advantage because you can use it to weight down whatever you are working on. You can use meat scissors to help dress chickens, instead of a knife. There are all sorts of adaptive equipment available; some you’ll have to think of yourself for each homestead task. Then there are ways to make a difficult task easier, too. For instance, sometimes it’s hard to unscrew the ring on a canning jar, one handed. But if you soak the jar in warm, sudsy water for a few minutes, it will usually unscrew easily, while held under your chin or in your armpit. Adapting to handicapping situations is never easy, but everything IS possible if you get tough and decide you WILL do it. Do you have a prothesis? Can you wear one? A friend of mine had his hand amputated after a car wreck. Gordy was a cowboy and as tough as they come. He got a prothesis (hook type) and soon learned to drive a team, drive his big truck and even tip his hat with finesse. I love labs too! Mine is going on 10, and is the most awesome dog! Spencer is beautiful and reminds me of our Nikita when she was a pup. I also wanted to add that the old horseman/farmer we bought our horses from had only one arm, and he gave shots to horses, cleaned stalls, drove a tractor, shoveled sawdust, worked with his 20 some horses, and more. My husband trained horses for him and I learned alot from this man. He never used a prothesis. Never had a choice, just learned to adapt I guess. Jackie, you are great! Have a Merry Christmas! Sure like that Spencer! Bear, our husky chow mix, saved our life more than once! 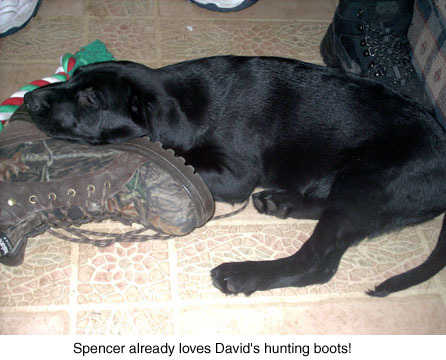 Jackie, enjoyed your blog on the new dog, Spencer and seeing David up close, I feel like I know you somewhat from your articles and stories on Starting over again….I think you are so cool! Congrats on the new grandson…enjoyed that picture also…Beautiful tree, so neat to be able to go out and cut one on the property and I am all for the simplifying of Christmas..it has become so commercial..I had wondered about your mom since you didn’t mention her in your last story? Hope you stay warm this winter we are trying to but with oil so high, life is getting more expensive…I am trying to do my homestead thing where I live in suburbia near a small town, I have chickens, big garden and can alot also!